Hand numbered limited edition of 600. 24 bit remaster. With inserts. what should I care about you and your fun? what should I care about you? ... As classic rock'n'roll album openers go, few beat So Far's It's a Rainy Day Sunshine Girl. Tom-tons bom-bom-bom-bom for a few bars, then a low bass piano copies it in the thud-thud-thud-thud. Then the Krautrock Temptations coo to each other: "It's a rainy day, sunshine girl, it's a rainy day, sunshine baby." Talk about a smart bloody opening. The best sax solo in the world chases the fade. It's my favorite ever Faust song. Have I said that enough times, yet? I'll be honest about it. I really like Krautrock. 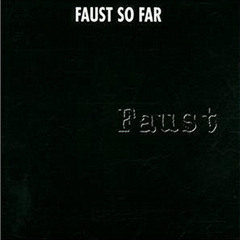 Faust So Far was released in an all black sleeve. The album has a shiny blackness to the music. There's an ominousness in the gross image that depicts the song No Harm, a small woman being attacked by a gargantuan man, which is disgusting and questionable. But I'm sure that it was intended to displease, though I can't say that is any great reason for an artist to do such a thing. 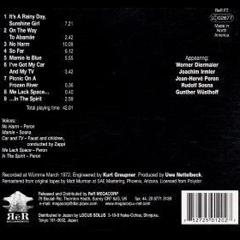 Elements of the Velvet Underground acoustic third album scene is picked out by Faust around this time. Also, the brass fanfare of the title track has a tough instrumental skank, pre-dating Can's Teutonic reggae excursions. Mamie is Blue is yet another rip off of the Soft Machine's "We Did it Again", but the drumming/synthesizer playing duel is truly astonishing music, especially those electric drill funk noises. Side 2 also contains more of the typical Faust semi-cut-up-threatening-to be-a-song-any-moment trip. I think they intended to record a Typical Rock Album as a basic standpoint, but they tried not to make the songs typical at all. Certainly, It's a Rainy Day, Sunshine Girl is the classic opener, and In the Spirit closes So Far the same way "America Drinks and Goes Home" ends the Mothers' "Absolutely Free", the same way "Jugband Blues" ends "A Saucerful of Secrets", the way "Something Happened to me Yesterday" ends the Rolling Stones' "Between the Buttons". Maybe I need a couple more examples. This is a great album. Search it out. In the search for a new approach to music, a new concept or at least a different eye on things, it seems to me people have been clutching rather wildly at straws. It's entirely understandable that, with the British music scene seemingly obsessed with its own and other peoples' past, with the vast explosion of the nouveau cliche, and very few people coming up with anything approaching originality of thought in their music, the seemingly rootless and unaccustomed sound of music from other European countries should be hailed as What we All Need. But personally, with the possible exception of some of the things Can have produced and the odd flashes from a couple of Danish bands, I haven't heard anything from the Eurorock tribe that has really satisfied me. Cautiously then, I'll say that what I've heard from the German band Faust makes me think that here at last is a band I can not only appreciate for their ideas, but also sit back and enjoy. Their first album was confusing when I first heard it, but side two which was recorded 'live' - that is, with no overdubbing - flows in a way that is more immediately obvious. My main reservation about the whole album is that the ideas haven't been translated into the technology as successfully as they could have been, and - in a way like Roxy Music - Faust don't have that intuitive feel that you get from musicians who've grown through a few bands, with some years on the road behind them. Their second album, So Far, seems to have allayed both those reservations. But what really marks them out for me is their rare ability to be serious without being over-earnest - not a sense of humour exactly, but a sense of proportion. So far they haven't done any live gigs and they won't until they're absolutely sure they can make it work in concert the way it works in a studio. It's not so much perfectionism, as a feeling that there's no point in going out and playing something that isn't what they envisaged. Due to their success in England, the next Faust album So Far was released here first. Again the packaging was novel, nigh-on all black with a portfolio of art inserts (one representing each track). So Far presented a very different Faust, with proper tracks and songs - well, kind of. Here, Faust's humour comes across most strongly, the lyrics to No Harm - 'Daddy take a banana, tomorrow is Sunday' - are sung repeatedly with such conviction, the listener is always left with the feeling 'do these lyrics really mean anything, or is it all a joke?'. Whatever So Far covers a lot of ground and is a most intelligently produced and performed album, featuring a lot more frenzied rock riffing than previously, more textured arrangements, and lots of off-the-wall ideas that work incredibly well. 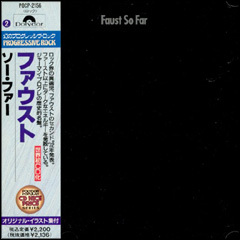 It seems that Polydor (in the UK) began to think of Faust as a pop band, releasing an alternative version of the So Far track as a single. An excellent little record, it sadly went by unnoticed. In the meantime, Wümme had become a renowned studio. Alcatraz, a one album wonder, recorded an album undoubtedly influenced by Faust, yet more towards heavy blues rock (a la Frumpy etc). Vampire State Building is well worth the attention of all Faust devotees. Also, the international trio Slapp Happy recorded their debut "Sort Of" there, and were aided by 3 Faust members. Technically the third Faust album, "Outside the Dream Syndicate", was a collaboration with American avant-gardist Tony Conrad. This featured just one very long track per side of monotonous, though not tedious, linear music for violin, bass, drums and electronics. The blending of minimalist styles and Faustian rock is a most successful exercise. Krautrock wasn't a movement, but a moment, a final thrust of the psychedelic project to gobble up every kind of music, and every kind of non-musical noise too, in order to excrete the outermost sound conceivable. But there were as many differences as affinities between the principal Krautrock players. If Can were fusion, Faust were fission. Can were into total flow; they oozed a self-irrigating flux of forms that grooved. Faust were more assembled, a concotion of jutting angles, jolting jump-cuts between genres, and jarring juxtapositions. Put simply, Can rolled, Faust rocked. Faust's aesthetic was one of rupture and randomness. They effected bizzare shifts in tone (from portentious gravity to zany goofing off, from placid poignancy to balls-out aggro) or made oxymoronic collisions of incompatible emotions that resonated like a strange chord. On So Far (1972), Faust proceed from the spartan velvet stomp of Rainy Day through the wistful folk-rock embroidery of On The Way To Abamae to the highly frictional funk of No Harm, spitting out sparks like a rogue trash-compactor. So Far itself is a lush labyrinth of tangled tendrils, like Miles Davis jamming with the Velvet Underground while Tim Buckley handles the backing vocals. 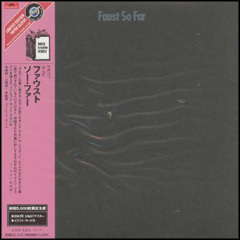 Where So Far is at least nominally divided into nine 'songs', the earlier Faust (also known as "Clear" because of it's originally translucent polythene cover imprinted with an X-Rayed hand) consists of three long suites. each is a quilt patched together from outbursts of acid-rock hoo-ha, zany chorale, found sounds, synnth-gibberish, freeform jazz, nonsense incantations, mock-muzak, animal noises (genuine and falsified), ad infinitum. The music doesn't connect vertically (incongruous noises are built up layer by layer) or horizontally (instead of narrative, it's a string on non-sequiturs). But somehow a wonderful dream-logic imposes itself. Pure Dada again. Anyone who's loved the last half-decade's reinvention of the guitar - the strange sonorities hewn by Sonic Youth, My Bloody Valentine, Mercury Rev, etc. - will instantly recognise Faust as a prime ancestor of 'our music'. These first-time-on-CD re-issues are essential, not just as a history lesson, but as living legacy, and as a reproach to an underachieving age. There's still so far to go. Ah, Germany in springtime. The leaves have returned, and the air is cool and of noble weightlessness. You can clearly see what the past has left behind in the medieval town squares, and hear the music of Bach's day playing continually from the opera houses and churches. Germans, like most of us, enjoy admiring nature. And since their cities have many parkland areas, it's no surprise to find the tourists crowding shops while the locals gaze in an auburn splendor. This is a country of quaint Bavarian villages and major metropolitan centers, majestic mountains and beautiful waterways, castles and culture. So, wouldn't it be nice if we dropped some acid, holed up like trolls and made an album? Faust's records have never been the kind you dissect. The band seems to have some kind of plan at work, but not the type of plan left for others to follow. It's not the kind of algorithm that bears any scrutiny; yet, 30 years later, the music remains. And given the state of the boys in der Gruppe, that alone makes it worthy of reissue. 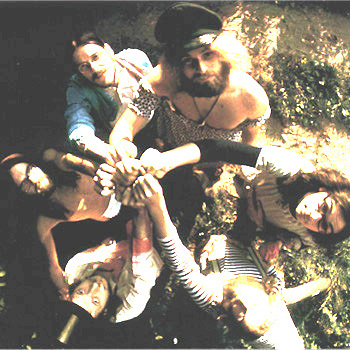 After spending several months in 1970-71 lazing, smoking, and existing rather superfluously (on Virgin Records' dime, of course), Faust moved their commune to Wümme in western Germany and decided to get serious. By serious, I mean they decided to put to tape the sugarplum visions in their heads. By sugarplum visions, I mean the acid-damaged prototypes of the New Solution for Music. By music, I mean their self-titled 1971 debut album and its contents, which consist of the music they played and processed using Kurt Graupner's infamous little black boxes. And by Kurt Graupner, I mean Faust's engineer, the sound wave saviour who, perhaps more than any other, was responsible for bringing the group's adventures in hi-fi to acetate. Why Don't You Eat Carrots? gets the movement underway with a knall ("bang," my kliene Kinder). Actually, it's more like the wake of a small jet whose engine roar is panned out all over your speakers. In the jet's cockpit, we have All You Need is Love and Satisfaction blaring, if only to remind you that Faust were at one time human and listening to your music. Upon reaching an altitude of about 120 decibels, our captains decide to let the aerodynamic vehicle coast, dropping a vaguely Bill Evans-esque piano interlude before launching a vaguely Zappa-esque groove that features some vague kind of shinai solo (or maybe one of their homemade synthesizers). I wish I could translate the sheer romantic terror of the thing, but it's all rather vague. Meadow Meal follows, and though the intensity has died down a bit, Faust still resides in the hall of mirrors. There doesn't seem to be much reason behind the stuff (other than the "wonderful wooden" variety), and though the by-product may be skewed art-pop along the lines of Throbbing Gristle or Nurse with Wound, the overwhelming vibe here is of playful curiosity rather than oppressive abstraction. After a mystical incantation ("And the guess I get it/ And the gate I get it/ And the game I get it"), they break into a trashy rock joint, shimmying like Monkees on parade. I suppose they couldn't have kept it down if they'd tried. And that ends the program as Faust planned it: a total of about 18 minutes of music before running out of steam and/or money. What to do, then, but jam out the mother of all documented freak-outs. Miss Fortune is probably not Faust's greatest legacy, but it is a testament to some fairly unadulterated haze-charisma. Recorded live, it consists of two rock-esque instrumentals (again filtered through Graupner's little black boxes), and one fantastic piece of prose set to a ghostly backdrop of acoustic guitar and admirably understated shakers. "And at the end, realize that nobody knows if it really happened." And at the end, I say "amen." Faust wasn't a hit by any stretch, but it was freakish enough to garner a cult following. So, with a small sect of the world waiting, the band retreated to Wümme again, presumably with the intention of making an album that you could at least play while sober. That album would turn out to be So Far, their 1972 sophomore release, and the record with which the press (or whomever it was covering them at the time-- probably just the NME's Ian MacDonald) caught up. Within seconds, the change is obvious. The steady tom toms and insistent rhythm guitar of It's a Rainy Day, Sunshine Girl aren't the work of the voodoo shamans on the last album - or maybe they are, but under pressure, perhaps Faust just betray their VU roots more readily (and simultaneously earn their Krautrock merit badge). But where there had been chaos, there was now tranquility; where there had grown paranoia and Dadaism, suddenly there sprouted mystique and atmosphere. A good start, but stay tuned. After On the Way to Abamäe, we're given signs that all is not well in the Faust camp. No Harm begins with a drawn-out crescendo that leads into a horn-driven instrumental. That's about as much as I can say about it. It's sort of indistinct, but in the context of the album, and coming from this band, it seems either very campy and strange, or oddly comfortable. In any case, the feeling doesn't last long, as three minutes in, the tune transforms into feverish blues-rock, with the phrase, "Daddy take the banana, tomorrow is Sunday," repeated ad nauseam. You know Faust, right? The funny part about Faust was, no matter how far out they got, they always came back. And on the title track, they trade in their acid wisdom for pure Kraut trance groove - though very different from Can's avant-funk or Neu's motorik beat - via horn punches and a galloping rhythm. And, like clockwork, just when you think they've managed the whole acid situation, Mamie introduces the buzzsaw of doom, replete with an intimidating synth force field and Moog vomit. Then, the chanting returns. The chanting! It's like some kind of game that only the Boredoms have figured out how to play since.